Dimethyl sulfoxide is know as an analgesic and nonsteroidal antiinflammatory. It is used as an effective drug delivery system and plays a role in drug design. Besides, it has many nonmedical uses, as a solvent, cleaner, pesticide, paint stripper, cryoprotectant and metal complexing agent. Dimethyl sulfoxide (DMSO) is a clear, colorless to straw-yellow liquid with a garlic-like odor. It is a hygroscopic chemical, stable under ordinary conditions. Dimethyl sulfoxide is a good polar solvent for unsaturated, nitrogen-containing and aromatic compounds. DMSO is miscible with water, ethanol, acetone, chloroform, diethyl ether, benzene, chloroform and most organic solvents. It should not be used with strong oxidizing or reducing agents. Dimethyl sulfoxide is frequently used as a reaction solvent for active substances synthesis and has shown advantages in numerous reactions including: addition, alkylation, cyclisation, etherification, esterification, substitution. Dimethyl sulfoxide dissolves a variety of organic substances like carbohydrates, polymers (polyacrylonitrile, polysulfone and polyethersulfone, polyetherimide, polyurethane), peptides, as well as many inorganic salts and gases. DMSO is extensively used as an extractant in biochemistry and cell biology. It can extract aromatic compounds selectively from mixtures containing both aromatic and aliphatic hydrocarbons. Thus, it is a competitive solvent to purify hydrocarbon fractions which have components with similar boiling points like BTX (benzene / toluene / xylene). Dimethyl sulfoxide helps solubilize most organic compounds without affecting the substrates. Thus, it is a great alternative to toxic solvents for industrial cleaners or graffiti removers. DMSO is one of the most efficient non toxic alternative to methylene chloride and n-Methylpyrrolidone for paint stripping formulations. Furthermore, Dimethyl sulfoxide is miscible with all most common paint stripper ingredients like co-solvents (e.g. : DBE, MEK), activators, thickeners. Dimethyl sulfoxide is used in PCR to inhibit secondary structures in the DNA template or the DNA primers. It is added to the PCR mix before reacting, where it interferes with the self-complementarity of the DNA, minimizing interfering reactions. DMSO may also be used as a cryoprotectant, added to cell media to prevent cell death during ordinarily caused by freezing conditions. Dimethyl sulfoxide is mainly instilled into the bladder for relief of interstitial cystitis and has been proposed as a topical analgesic and nonsteroidal antiinflammatory. Because of its ability to penetrate biological membranes, it is used as a drug delivery system. Drugs such as insulin, heparin, phenylbutazone, and sulfonamides may all be absorbed systemically when mixed with DMSO and applied to the skin. It was also shown to relieve pain and swelling, relax muscles, relieve arthritis, improve blood supply and slow the growth of bacteria. Because of its ability to dissolve many kinds of compounds, DMSO plays a role in high-throughput screening operations in drug design. In the United States, DMSO has (FDA) approval only for use as a preservative of organs for transplant, for interstitial cystitis and for limited veterinary use. It is not allowed for use as a dietary supplement. Dimethyl sulfoxide is commonly used as a liniment for horses, alone or in combination with other ingredients. It is used alone for the treatment of increased intracranial pressure and/or cerebral edema in horses. 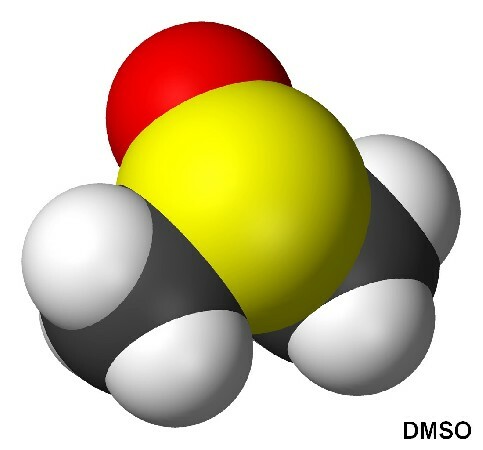 DMSO is used in the electronic industry, especially in the flat screen panels manufacture. Metal complexing agent (a common ligand in coordination chemistry, e.g. the complex RuCl2(DMSO)4, features DMSO bonded to ruthenium through sulfur and through oxygen).